“My family goes back to 1928, everyone grew up out here,” said Jan Gagnon of her beloved home in Pointe Louise. Jan has been a fairly quiet player in the Pointes Estates and Pointe Louise wetland feud. But as she admitted in an interview today, she put the bee in her husband, Peter Gagnon’s, bonnet eight years ago. And so the Pointes Protection Association was formed under Peter’s lead as well as Rick Gartshore – who was also encouraged by his wife. Peter is a Registered Professional Forester. He worked for the Ministry of Natural Resources for 30 yrs. The Pointes Protection Association represents about thirty-one families and was formed to provide a coordinated voice for the residents of Pointe Louise and Pointe aux Pins in response to the Pointes Estates Development proposal put forward by local developer Jeff Avery. Mr. Avery had hoped to establish a 91-lot subdivision complete with a man-made canal inconveniently located on a wetland. On February 27th, 2015 the Ontario Municipal Board ruled against Mr. Avery’s appeals to move the Pointe Estates project forward. This was just one, but a very important one, factor that informed the OMB’s final decision. What Peter’s old school maps demonstrated was a 77% loss of the coastal wetland should the development proceed. And, as has been the horse that has been beaten to death, as per the Provincial Policy Statement 2014 development and site alteration of a coastal wetlands in the Algoma District are prohibited, unless there will be “no negative impacts on the natural features or their ecological function”. Also, in part and specific to the Pointe Louise wetland, the 2014 PPS defines ‘coastal wetland’ as “any wetland that is located on one of the Great Lakes or their connecting channels (Lake St. Clair, St. Marys, St. Clair, Detroit, Niagara and St. Lawrence Rivers)”. 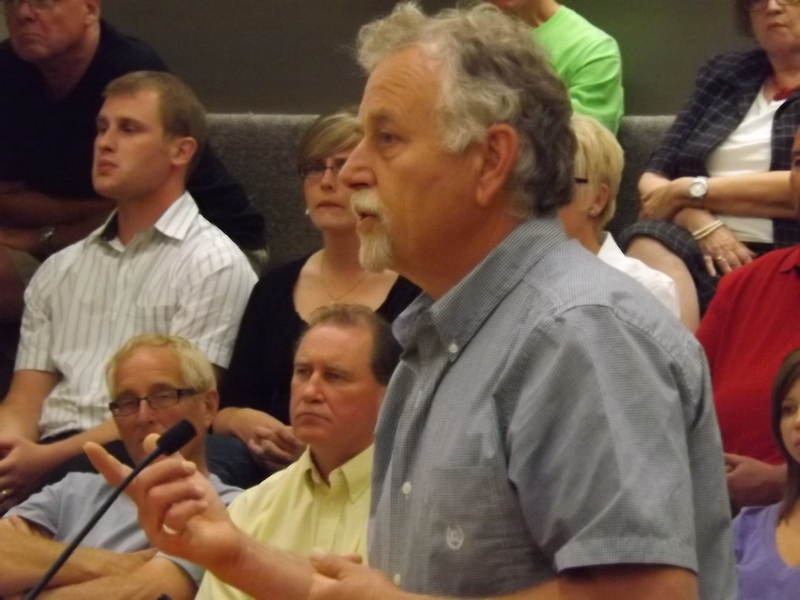 Peter did express that he is confounded that some folks are still hung up on the fact that the Ministry of Natural Resources conducted an Ontario Wetland Evaluation (OWES) that found the Pointe Louise wetland not to be provincially significant- something that might have mattered prior to the release of the 2014 Provincial Policy Statement. And though the point is moot, Peter also questions the reliability of the MNR’s OWES report. During the OMB hearing Susan J. Meades, a field botanist with over 30 years experience, presented compelling testimony that may pique interest to conduct yet another OWES by an independent party. Ms. Meades identified over 30 wetland plant varieties that were not identified on the MNR OWES report. Further, the MNR OWES report indicates several plants that are found above the wetland which could indicate the study was not even conducted in the proper area. Peter goes further to question the accountability of the various entities connected to the wetland issue. But now that they fight seems to be over the next hurdle will be paying the bills. Over the past eight years the PPA racked up about $100,000 in professional reports and legal fees with about $20, 000 still owing. A spring fundraiser is planned to help offset those final costs and those details are in the works. The PPA will continue to represent the area and according to Peter, there will be more time to focus on other projects such as getting high speed internet to the area and working with partner organizations like Freshwater Futures, the Lake Superior Watershed Conservancy and the Bi National Public Advisory Committee on maintaining the Pointes area as a safe, environmentally friendly neighbourhood. Jan shared some final thoughts that summarized the effort over the past eight years. A thorough account of the OMB hearing can be found here and for more background on this story click here and here. To read about Mr. Avery’s reaction to the OMB hearing click here and to read the full OMB final decision click here.